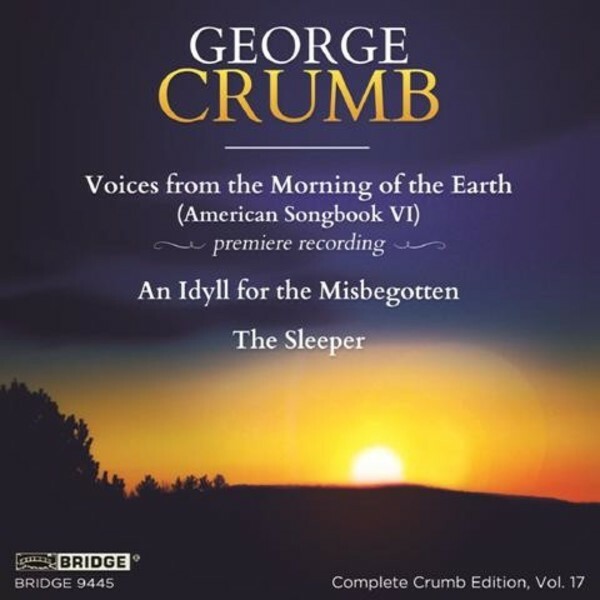 Voices From The Morning Of The Earth: A Cycle of American Songs from North and South, East and West (2008) is the sixth of seven American Songbooks that occupied George Crumb for most of the millennium�s opening decade. This recording (Volume 17 of Bridge�s Crumb Edition) completes Bridge�s cycle of Crumb�s American Songbooks. The seven songbooks are approximately five hours in length, and constitute George Crumb�s magnum opus. Also on this CD is Crumb�s Idyll for the Misbegotten. The composer writes that �flute and drum are to me those instruments which most powerfully evoke the voice of nature. I have suggested that ideally (even if impractically) my Idyll should be heard from afar, over a lake, on a moonlit evening in August�. The Sleeper, with words by Edgar Allan Poe, transforms Poe�s lugubrious meditation on a dead beloved (�Soft may the worms about her creep!�) into a haunting ode to a woman slumbering beneath the �mystic moon�.